Watch 2013 draftee Jonathon Marsh in action. Marsh became a Magpie with selection No. 77. 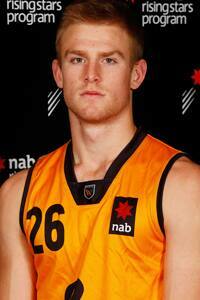 Watch new Collingwood recruit Jonathon Marsh in action at junior level in 2013. Jonathon Marsh was drafted to Collingwood with selection No. 77 in the 2013 National Draft. Profile: Marsh threw himself into contention after a great NAB AFL Under-18 Championships with Western Australia. His performance against the Northern Territory, where he gathered 22 possessions and kicked four goals, raised eyebrows from talent scouts around the country. The younger brother of Sydney Swan Harry Marsh, who was taken with pick No.46 in the 2012 NAB AFL Draft, Marsh offers plenty of upside for clubs looking for a forward. At the Draft Combine, Marsh won the 20m sprint with a time of 2.78s and finished third in the repeat sprints in a time of 24.18s. Derek Hine Says: "He is a 194-cm forward from Margaret River who played for East Fremantle for one year. He has a lot of work to do but he has extraordinary speed, has really good size and really good power in his game." "The West Australian is one of this year's most compelling draft prospects...Marsh had played most of his junior footy through the wing and midfield before this season, when he took on a key-position role up forward. His best game of the championships came against Vic Metro at Patersons Stadium, when he almost singlehandedly turned the game Western Australia's way with three goals and a blistering final term. He is not quite a modern-day key-position height (192cm), but is probably too big to play as a full-time midfielder," - Callum Twomey, AFL.com.au, 4 November. "Freakishly athletic forward. Right in the top 10 mix," - Sam Landsberger, Herald Sun, 3 July. "I see myself as a tall midfielder, even though they’re saying I’m a half forward. I’m just pretty explosive with my speed and yeah, I like to think I’m pretty exciting, but everyone’s got their opinions," - Jonathon Marsh, collingwoodfc.com.au, 22 November. Graphic courtesy of AFL Media.